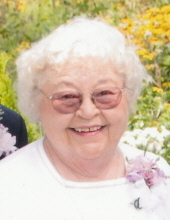 Helen L. Beer, 86, daughter of James Emmert & Anna Irene (Dwyer) Foster, was born March 17, 1932 in Greenfield, Iowa. She passed away Friday, October 26, 2018 at the Panora Specialty Care Center, Panora, Iowa. Helen graduated from Greenfield High School and the University of Northern Iowa. On August 8, 1954, she married Robert Beer in Greenfield, Iowa. They moved to Denver, Colorado and then to California for about 10 years. They moved to Adair, Iowa and opened up a restaurant and ran that for the next five years. Helen then worked at various jobs in Adair and Adel before moving to Lake Panorama in the late 1970's. After 12 years they moved into Panora. Helen enjoyed reading, sewing, cooking, fishing, and most of all, spending time with her grandchildren. She is survived by her husband, Robert Beer of Panora; daughter, Connie (Todd) Kirkpatrick of Plymouth, Iowa; son, John (Tracy) Beer of Panora; 4 grandchildren; 7 great-grandchildren; and brother, Jerry Foster of Normal, Illinois. She was preceded in death by her parents, two grandchildren, two brothers, and a sister. Funeral Services will be 1:00 P.M., Tuesday, October 30, 2018 at the Twigg Funeral Home, Panora. Burial will be in the West Cemetery, Panora. Visitation will be Monday, October 29, 2018 from 5-7 P.M. at the funeral home. To send flowers or a remembrance gift to the family of Helen Louise Beer, please visit our Tribute Store. "Email Address" would like to share the life celebration of Helen Louise Beer. Click on the "link" to go to share a favorite memory or leave a condolence message for the family.